The subtitle “A Dickens of a Tale” is what actually caught my eye. A longtime fan of the work of Charles Dickens I was intrigued by the inclusion of his name in the title. The historical figure of Charles Dickens does appear in The Cheshire Cheese Cat as a minor character with a few pivotal interventions in the plot. I am not convinced that his character will resonate with young readers–but his is the only exception among all the other characters in the story. The main characters are actually a cat named Skilley and a mouse named Pip. The Cheshire Cheese Inn is widely acknowledged in 19th Century London as producing the best cheese in the world. Skilley, tired of living in alleys and dodging the angry swats of brooms, is also hiding a secret which draws him to The Cheshire Cheese Inn. Once he is allowed to take up residence there he encounters Pip, a mouse with secrets of his own. The Cheshire Cheese Cat is a remarkable story of friendship–its challenges and its rewards. The characters are surprisingly well-developed alongside their realistic animal characteristics. A difficult accomplishment with animal characters in a novel, Deedy weaves self-discovery, adventure and mystery sprinkled with occasional doses of humor masterfully throughout Skilley and Pip’s story. This is a fantastic independent read for kids who are graduating from shorter, simpler chapter books to larger formats, higher vocabulary and more complex story structures. For the same reasons it is an excellent read-aloud toward the end of 2nd Grade all the way through elementary school. Although I probably wouldn’t use it as a read-aloud in middle school it is still a great independent choice for all ages. I am usually not a huge fan of animal-themed novels and I thoroughly enjoyed this read. 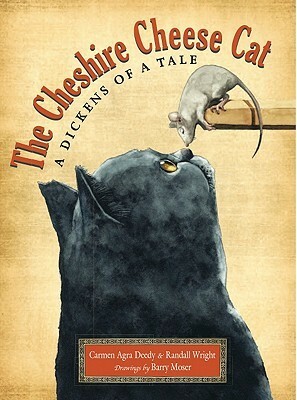 I love an unexpectedly great story and The Cheshire Cheese Cat is a masterful example!